In 1952, the prison in Jackson, MI, known as the State Prison of Southern Michigan, was the largest in the world. In April of this year would be a riot that would gain national attention. The riot, which would last five days, would get not only hundreds of Michigan State Police officers involved but also the Governor himself (1). 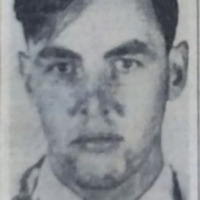 The State Prison of Southern Michigan was run by warden Julian Frisbie, who “had been appointed in 1948, straight from a career in the Marine Corps" (2). During Frisbie’s time in the Marine Corps, he was placed in charge of the Naval Disciplinary Barracks where he had dealt with AWOLs and insubordinates (3). Even with this past experience, the warden and his Corrections Commissioner Earnest Brooks had no idea how to stop a riot, going on to say, “I didn’t know what to do" (4). This shows the lack of preparation the State Prison of Southern Michigan had for such an event at the time. The riot started on Sunday, April 20th, 1952 in cell block 15, where prisoners with mental illnesses and maximum-security threats were kept. An unknown inmate was able to get a hold of the keys of a new guard, switching places with him. 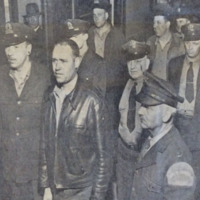 This inmate released two of his fellow inmates who would go on to be the leaders of the riot, Earl Ward and Jack Hyatt. Ward and Hyatt were both well-known inmates to the guards because of an earlier attempt to kidnap Governor G. Mennen Williams and use him as a shield to escape Marquette Prison. That attempt got them transferred to Jackson Prison. 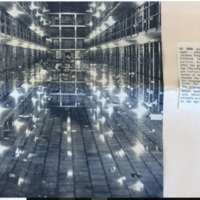 With their release by the unknown inmate, Ward and Hyatt were able to open the cells of almost 200 other prisoners, as well as hold the rest of cell block 15’s guards hostage (5). Ward quickly emerged as “‘the “natural” leader of the rebellion,”’ and with some help managed to lock up a few of the more dangerous inmates (6). 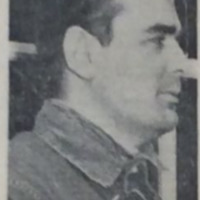 Ward also put Jack Hyatt in charge of the hostages, “which immeasurably increased their security,” because no one dared to challenge “Crazy” Jack Hyatt (7). These two men went on to request from Warden Frisbie the presence of a reporter. This was their first request of the prison and would foreshadow Ward’s obsession with the press. Ward, the spokesmen for the cell block, revealed that their frustration stemmed from “‘brutality’ by inmate nurses in the prison mental hospital" (8). The inmates also said they rioted in “protest of bad food, poor medical care and brutality on part of the guards (9). The inmates made signs on bed sheets proclaiming their demands which they hung from the prison (10). The riot spread throughout the rest of the prison the next morning, Monday the 21st, during breakfast. This full-prison riot brought absolute chaos. There were attacks on guards, destruction of property, arson, and theft. 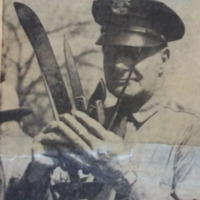 Warden Frisbie lost control of the entire prison after deciding to treat cell block 15 as an isolated incident and allow prisoners to be released from their cells for breakfast as usual. The north side ate and returned without incident. During the south sides breakfast, someone had put salt in the coffee which led to prisoners shouting “Arsenic,” and storming the kitchen onto the yard. While loose on the yard the prisoners took “whole quarters of beef,” which were “roasted on bonfires,” as a barbeque (11). The prisoners also took the opportunity to resupply cell block 15 with enough food to last them for weeks. On top of that, more guards were rounded up and taken to cell block 15 as hostages (12). By Monday night, the prison officials, with the help and force of the Michigan State Police, were able to gain back the control of the prison, aside from cell block 15 (13). The prison riot caused over 2.5 million dollars in damages. The next couple days would involve negotiation between Ward and Vernon Fox, the Deputy Warden for the Department of Individual Treatment with a Ph.D. in sociology (14). Fox used these talks as a way to get into the rioters’ heads and convince them to believe whatever he wanted them to. 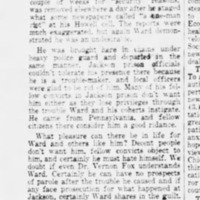 Ward saw Fox as an ally with who to develop his demands and actually get them heard and approved by the prison. Both Fox and Ward were convinced that each other and themselves were very important to the riot, and “each was inclined to inflate his own importance and both groping for legitimacy within their respective ‘camps’ by finding grounds of accommodation with the other" (15). On Wednesday the 24th, Governor G. Mennen Williams and the prison agreed to a list of 10 demands/requests from Ward and his fellow rioters. These demands included: a remodeling of cell block 15, access to leisure activities and officials, separation of people threatening others with sexual assault as well as “those practicing homosexual activities,” the removal of all “restraint equipment,” every prisoner receives his due food and other items regardless of position or crime, no weapons inside the prison, access to dentists, the creation of an “inmate advisory council,” and no retaliation from the prison (16). As a result of the inmates holding the hostages, they were described as “holding the whip hand,” during negotiations (17). Eventually, the leaders of the riot were “indicted for conspiracy and the demands remained largely unmet" (18). 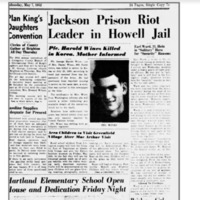 The 1952 Jackson Prison riot resulted in the death of one prisoner, wounding of several others, and a number of guards injured (19).After the riot, Ward was moved out of Jackson to Howell, MI. There he was put into solitary confinement for the not only others’ safety, but also his own (20). Also, while at Howell, Ward attempted to stage another riot after being rejected by a newspaper who he wanted to use his picture (21). He was once again moved to another jail in Pontiac, MI, being called a “publicity seeker" (22). Jack Hyatt, who was transferred from Jackson as well, was released in July of 1962 to Canada, where he is originally from (23). Deputy Warden Fox resigned following the riot, with many of his fellow prison employees disapproving of how he handled it. Some even saying that he was on an “ego trip" (24). In the year 1952, there were seventeen other major prison riots occurring within the United States. In the New Jersey State Reformatory, prisoners went on a hunger strike and publicized their demands via the prison’s windows(25). This New Jersey prison experienced three different riots throughout 1952, taking place in January, April, and October. The inmates, who vowed to not give up as they had nothing to lose, were fighting for better living conditions, removal of the current warden, and no more beatings(26). The second of these riots took place just days before the April riot at Jackson. At the Ohio Penitentiary in Columbus, a riot broke out on October 31, 1952, that became known as the “Halloween Riot"(27). The prisoners there were rioting in attempts to improve their conditions as they had been experiencing overcrowding. The prison riots at this time is a direct symptom of the poor conditions that many prisoners experienced nationally. 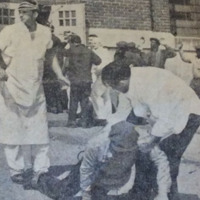 Rioting was, and remains, one of the few ways for prisoners to ensure that they would not be ignored. 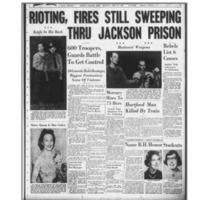 “Rioting, Fires Still Sweeping Thru Jackson Prison,” The News-Palladium, April 21, 1952, 1. Charles Bright, Law, Meaning and Violence: Powers That Punish: Prison and Politics in the Era of the Big House, 1920-1955 (Michigan: University of Michigan Press, 2010), 194. Bright, Law, Meaning and Violence: Powers That Punish: Prison and Politics in the Era of the Big House, 1920-1955, 196. Ed F, Smith., “Frightened Writer Talks to Mutineers,” The News-Palladium, April 21, 1952, 16. U.S. Prison Riots AKA U.S. Prison Riots- Sensational Scenes of Prison Riot in Jackson Prison (1952) [Video]. Retrieved Nov. 5, 2018, from http://www.youtube.com/watch?v=NxS5NB5zqMI. Bright, Law, Meaning and Violence: Powers That Punish: Prison and Politics in the Era of the Big House, 1920-1955, 197. Charles Bright, Law, Meaning and Violence: Powers That Punish: Prison and Politics in the Era of the Big House, 1920-1955 (Michigan: University of Michigan Press, 2010), 198. Charles Bright, Law, Meaning and Violence: Powers That Punish: Prison and Politics in the Era of the Big House, 1920-1955 (Michigan: University of Michigan Press, 2010), 199. Howard, Rugg, “Calls Facts Incorrect-Lawmaker Hits Governor’s Practice of ‘Blaming the Legislature,” Lansing State Journal, April 24, 1952, 10. U.S. Prison Riots Aka U.S. Prison Riots - Sensational Scenes Of Prison Riot In Jackson Prison (1952) [Video]. 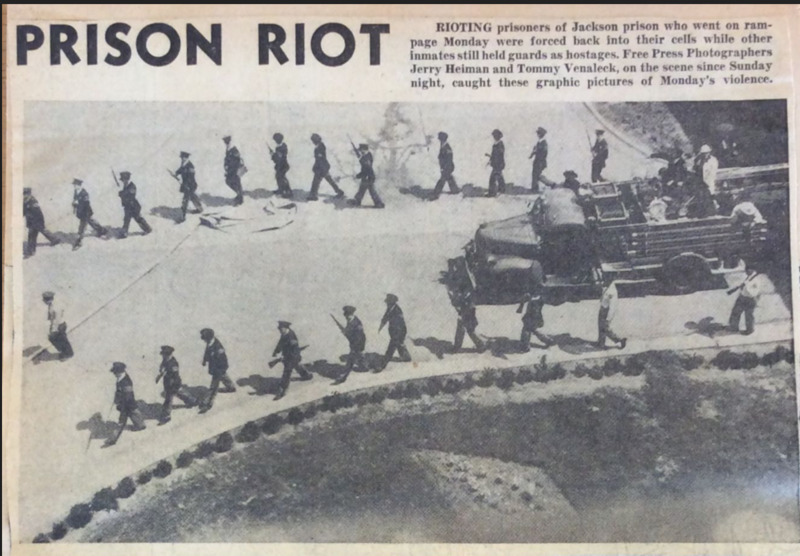 Jon Harrison, ”April 20-25, 1952: Prison Riot in Jackson,” Red Tape, published April 20, 2018, accessed November 5, 2018, https://blogs.lib.msu.edu/red-tape/2017/apr/april-20-25-1952-prison-riot-jackson/. 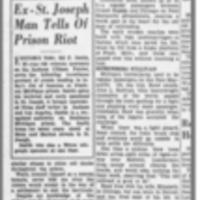 “Jackson Prison Riot Leader in Howell Jail,” Livingston County Daily Press and Argus, May 7th, 1952, 1. “Not Wanted,” Livingston County Daily Press and Argus, May 21th, 1952, 14. 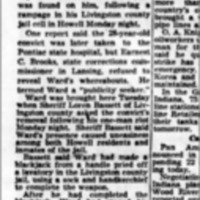 “Riot Leader At Pontiac-Earl Ward Transferred After Latest Uprising in Howell Jail,” Lansing State Journal, May 14th, 1952, 1. 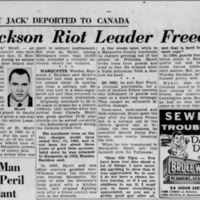 “Crazy Jack Deported to Canada-Jackson Riot Leader Freed,” Detroit Free Press, July 17th, 1962, 10. Charles Bright, Law, Meaning and Violence: Powers That Punish: Prison and Politics in the Era of the Big House, 1920-1955 (Michigan: University of Michigan Press, 2010), 205.